This is funny. 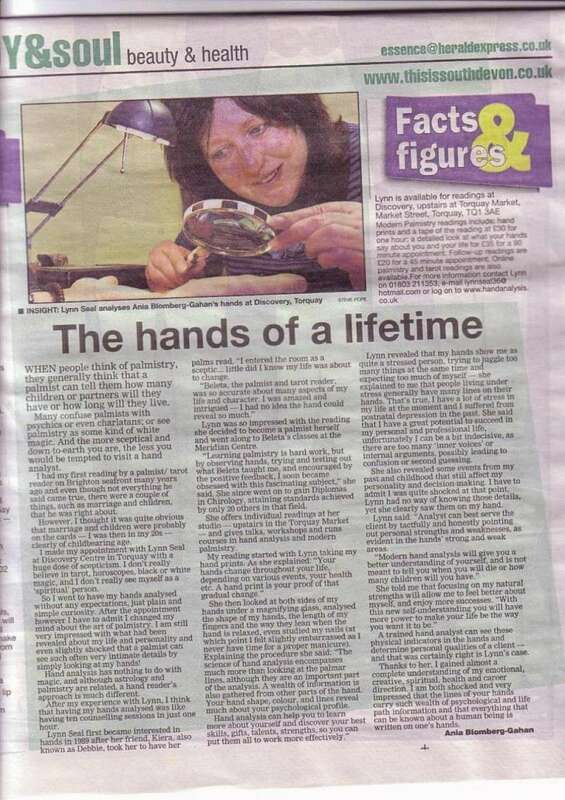 A local journalist asked me to do an interview for a feature "Ladies who lunch", for our local newspaper. Why is it funny? 1 - I never go out to lunch! It's the coastal zoo 30 mins walk from my home where they have birds, fish, octopus (not "Paul the psychic octopus" unfortunately), seals & penguins. I chose it because of the wonderful sea views from the cafe. Only later did it occur to me what a fool I was to choose "Living Coasts"........ my surname is Seal. Hence I've had loads of jokes about "I thought feeding time for the Seals was midday?" "oh you had salad for lunch? I expected you to have the fish." oh ha,ha, like I never heard that one before! tch! anyway she gave me a good write-up. This is the same journalist who interviewed me about 6 months ago. Note Ania & I both have very closed body posture / hand gesture - arms folded in front of us, cos neither of us like having our photo taken. I'm not smiling, I'm gritting my teeth! We were very relaxed once the photographer had gone! ;-) Hope pic quality is clear enough for you to read the text. if you can't read them, pls let me know and I will try to host higher resolution pics somewhere. or try clicking full size pic, then hold ctrl button down whilst scrolling forward on mouse to zoom in. Re: Lynn in the news! Great lynn. 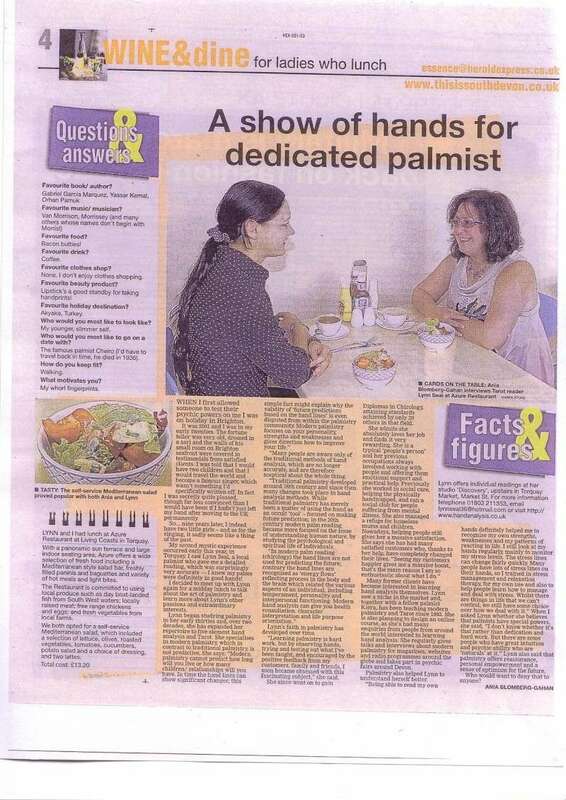 Nice to know the western's increasing awareness on palmistry through journals. I think you delivered excellent interviews!! Also, interesting to see that the issue of 'stress' is one of your major interests. I could imagine that you could provide more info about that on your website. To be continued! Thanks & well done!! You go, girl!!! Great interviews. And you're very funny! I have a stupid American question-- What are bacon botties? Roberta....oops, yeah it's small print....it says "bacon butties". A butty is northern English for a sandwich. I know it's not healthy food but I love them! Botties are completely different!! A botty is childish slang for a "bottom", ( ie. 'buttocks' as opposed to 'butties') !!! I wouldn't want to eat one of those! So very good. You really do, as said, do very good interviews. So down to earth and unassuming. Best Wishes. sorry off topic but ..... ... I mentioned Paul the psychic octopus above (who gave us so much fun with his world cup predictions on Sue's forum). I didn't know that psychic Paul died on Tuesday! Well, Lynn, I'm a complete ninny! What can you expect from an American? But in my defense, the print is small. The good news is that I've learned some new northern English phrases. I'm Queen of the Veggie Burgers but I remember looong ago how yummy bacon "butties" were! Thanks for enlightening me. Roberta, glad that 'bacon butties' didn't offend you as a veggie! by the way, I don't even miss bacon when I visit Turkey. I could equally have answered 'chana dal'. I guess I have several 'favourite foods'. I read it at the time of posting it on the forum. Great Interview !! I really feel very happy to read it again and again.